Data from Baldwin Locomotive Works Specification for Engines as digitized by the DeGolyer Library of Southern Methodist University Volume 29, p. 82. Works number was 28219 in May 1906. Serving steel mills in the Birmingham, Ala area, this road was chartered in 1878 . Tennessee Coal & Iron was organized in 1886 to operate the line and did so until the Southern and Louisville & Nashville bought the line in 1899. TCI & R, the TCI's successor, bought the road from the Southern and L & N in 1906 and US Steel acquired the TCI&R in 1907. by 1916, the railroad owned 40.7 miles of main line, 78.8 miles of yard tracks and sidings. The BS operated independently as a terminal and switching road through all these corporate changes. The locomotives were lettered for the Birmingham Southern and included this robust Consolidation. It's a bit surprising that a 1906 standard-gauge 2-8-0 would use a firebox that was only 42" wide. Data from TCI&RR 1949 locomotive diagrams supplied in May 2005 by Allen Stanley from his extensive Rail Data Exchange. This was a loner from Pittsburgh (works #55687) that was quite similar to the Brooks engines delivered to the TCI & RR's Birmingham Southern in 1910 & 1912 (Locobase 9195), but with superheat built in. The first three of this class came to the TCI&RR from Brooks in 1910 (works #46953 and 1912 (53278-53279) as saturated-steam engines. They were joined nine years later by a Richmond quintet, which were superheated from the start. The latter were delivered in pairs and a single (works #62606-62607 in 1920, 63354-63355 in 1922, and 64379 in 1923). The Brooks engines were soon superheated and the class was treated essentially as one from that point on except for a three-ton disparity in weights. 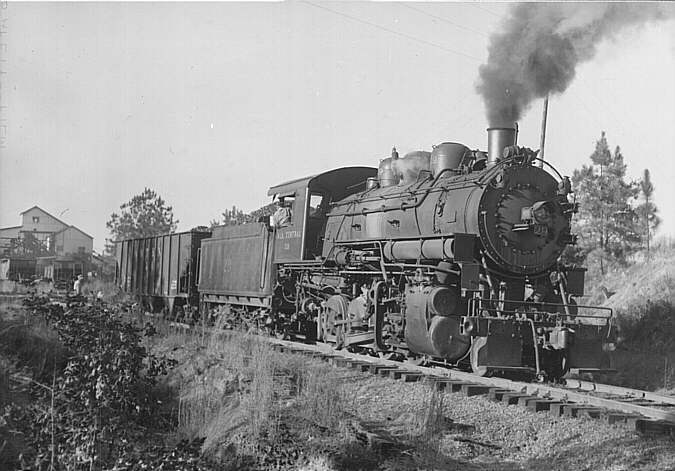 One of the Brooks engines -- 53278 -- later operated as the only 2-8-0 on the Western Railway of Alabama; see Locobase 7312. Data from NC&StL 9 - 1925 Locomotive Diagrams-CLR CHTS supplied in May 2005 by Allen Stanley from his extensive Rail Data Exchange. See also DeGolyer, Volume 12, p. 114. Works number was 7493 in November 1884. One-of-a-kind Consolidation from Baldwin with low drivers that was delivered to the road when it still operated on the five-foot gauge. Its specification called for 180 tubes in front of a relatively wide and shallow firebox. Later in its career, the railroad probably replaced the boiler with a slightly larger one hold 196 tubes that yielded 1,501 sq ft (139.45 sq m) of tube heating surface area and 1,644 sq ft (152.75 sq m). Weight increased considerably to 106,600 lb (48,353 kg) on the drivers, which the factor of adhesion to 4.35, and 120,200 lb (54,522 kg) for the engine. In 1887, the TCI & R was absorbed by the Nashville, Chattanooga & St. Louis and #9 was renumbered 92. Now on the standard gauge, the #92 continued in service, being renumbered #305 in 1915. After more than 40 years in service, the locomotive was scrapped in September 1928.